Once a list appears, you are able to edit. Click the Detail button in the appropriate entry. When Details appear, pencil/trash/plus buttons and open fields are available for modifications to the data. Click in the fields for Site Phone, LOA Type, and LOA Notes to enter data. You must click the Update button to complete the entry. Employer Information – Employee No., Status, FTE, Site Unit are not edited by UNA, but appear exactly as provided by employer. UNA receives this electronically from some but not all employers. The difficulty in searching this information is the inconsistent way information is recorded by the Employer. To get valid results using these fields, consult your Employee list to ensure you are using the same terms the employer is using. 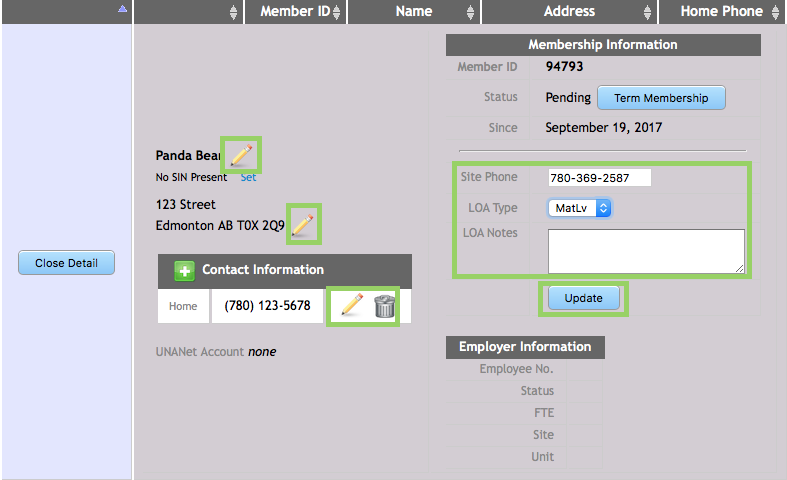 If the Employer Information is available, you will see it in the Detail view for any member. A separate section is required to access this data.